Carlos with Paul Vunak on September28, 2008, the day he received his PFS Certificate for Apprentice Instructorship. Latin percussionist, martial artist, Yoruba priest, and “Oba-Anyan” (keeper of the sacred drum knowledge) embarks on a spiritual quest to explore trance induction through rhythm; specifically Afro-Cuban beats. The results are hypnotic and trancy for sure. Definitely interesting and worthy. I actively listened to this one afternoon and definitely felt as though I went into a trance. 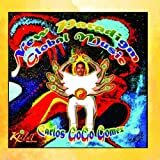 New Paradigm Global Music: A Laws of Attraction seminar turns a sought after Latin percussionist into a new ager that makes something that could easily fit into New Earth's release schedule? I thought that was just girl fiend stuff. Toning down the funk to an appropriate level, this is a new stage new wave set that let's you funk easy as you send your thoughts somewhere positive. As a politician would say, "it's the rhythm, stupid" that sets this apart from typical new age. Perhaps this is the jumping in point genre skeptics have been waiting for? Eartha Kitt said I reminded her of Chano Pozo; this photo proves it!